While everything else such as the fisherman’s house, boats and the water are painted in shades of deep purples and browns, the sun shines brightly in a garish orange colour. The unique, haphazard designs of the batik decorate this piece tastefully, giving this piece a vintage and antiquated atmosphere to it. It reminds one of dusk, just as the sun is about to set, when it shines its brightest. Siew Teng expressed a great interest in batik art at a very early age and was exposed to this art medium by the master of batik art, his father, Dato’ Chuah Thean Teng. 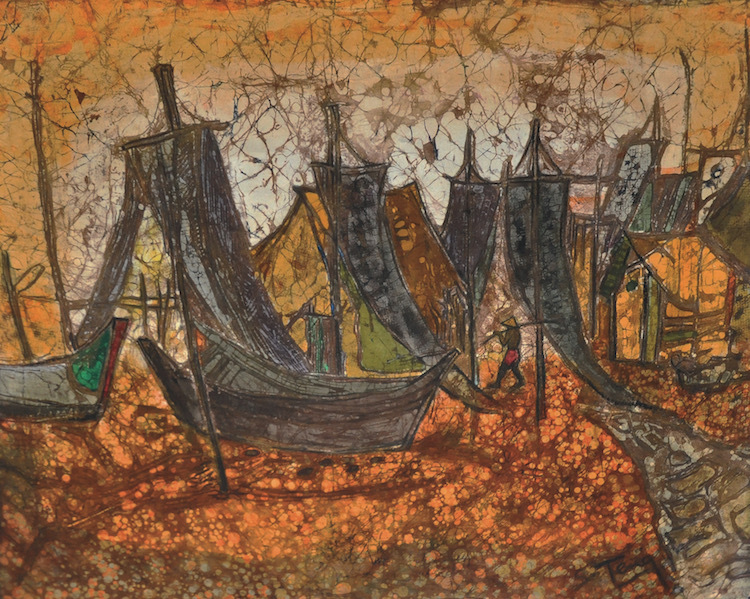 In 1961, 1962 and 1963, Siew Teng was the winner of the “Art Prize” in the open art competition held in North Malaysia. In 1964 he won the “Certificate of Merit” at the National Art Competition with his painting entitled “Joy of Living”. The following year he was awarded a prize at the Malaysia Artist Competition for his painting “Outdoor”.